New York/Houston: Kinder Morgan Inc struck a $21 billion deal to buy rival El Paso Corp, combining the two largest natural gas pipeline operators in North America in a huge bet on the fast-growing market for that fuel. The combined El Paso and Kinder Morgan would own about 80,000 miles of pipe stretching from coast to coast, and could demand higher transport fees from oil and gas producers, which could then raise the prices that power companies and other end users pay for gas. “Now that KMP is by far the biggest pipeline distributor of natural gas, that will also give them pricing power over the market, which could lead to price pressure to the upside for natural gas," said Chris Jarvis, president and founder of Caprock Risk Management in Rye, New Hampshire. “We expect this to have a positive impact on the natural gas markets, likely setting the stage for addition mergers and acquisitions in the space." It was not immediately clear how regulators would view the deal. Kinder Morgan said it expected the deal to close in early 2012. Despite weak natural gas prices, production of the fuel has been rising as energy companies pile into shale fields -- underground formations rich in oil and gas. In the Eagle Ford Shale in South Texas, where there are scant pipelines, companies are having to rely on trucks and are building rail terminals to handle the vast field’s output. 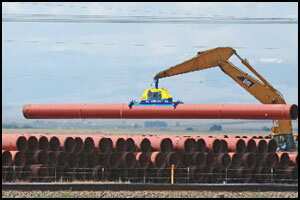 El Paso already owned the largest natural gas pipeline system in North America, with more than 43,000 miles of pipe. The combined company would own 67,000 miles of natural gas pipe and another 13,000 miles of pipelines to move refined products and other fuels. “We believe that natural gas is going to play an increasingly integral role in North America," Kinder Morgan chief executive Richard Kinder said in a statement. “We are delighted to be able to significantly expand our natural gas transportation footprint at a time when it seems likely that domestic natural gas supply and demand will grow at attractive rates for years to come." Kinder Morgan went public in February after CEO Kinder and private equity partners including Carlyle Group and Goldman Sachs Inc’s buyout arm Highstar Capital and Riverstone Holdings took the company private in a management led buyout in 2007. The private equity firms sold a 13.5% stake in the company’s IPO, but Kinder and the buyout funds still hold a vast majority of the company. The deal derails El Paso’s plan, announced in May, to split into two publicly traded companies, which would have separated its exploration and production business from its pipeline operations. Kinder Morgan said it plans to sell El Paso’s exploration and production assets. The $26.87 per share offer consists of $14.65 in cash, 0.4187 Kinder Morgan shares -- valued at $11.26 per EP share -- and 0.640 Kinder Morgan warrants -- valued at $0.96 per EP share -- based on Kinder Morgan’s closing price on Friday. The warrants will have an exercise price of $40 and a five-year term. Including El Paso’s debt, the deal tops $38 billion, making it the second biggest merger in 2011 behind AT&T Inc’s $39 billion deal to buy Deutsche Telekom’s T-Mobile USA, according to Thomson Reuters data. Kinder Morgan said it has a commitment letter from Barclays Capital underwriting the $11.5 billion in cash required for the transaction. The deal also highlights the advantages that energy infrastructure companies have gained in recent years by using a financial structure known as master limited partnerships (MLPs), which pay no corporate taxes but distribute the lion’s share of their profits to investors and the general partner through dividends. Companies like Kinder Morgan -- which owns nearly all of its assets through its MLP, Kinder Morgan Energy Partners -- have a tax advantage over their competitors and have also received higher valuations from investors. This gives it a financial leg up over a company like El Paso, which still holds a substantial amount of its assets outside of its MLP, El Paso Pipeline Partners. Tudor Pickering analyst Brad Olsen said that the takeover mirrors Energy Transfer Equity’s more than $5 billion deal for pipeline company Southern Union. “It’s not a coincidence at all that the two big pipeline deals done this year have been by big MLPs with decelerating growth. Their general partners have gone out and snagged undervalued pipeline assets," Olsen said. Moreover, Kinder Morgan said it plans to pay down much of the substantial amount of debt it is picking up from the takeover by selling off El Paso’s assets to its MLPs. The new company hopes to generate $350 million a year in cost savings, or about 5% of the combined companies’ earnings before interest taxes, depreciation and amortization. Kinder Morgan expects to be able to increase its dividend after the deal closes due to these savings. It said that if the deal were to close at the beginning of 2012, it would expect to be able to pay a dividend of about $1.45 a share that year. But because it expects the deal to close later, it said its dividend will likely be slightly below that target. Evercore Partners and Barclays Capital advised Kinder Morgan on the deal, while Morgan Stanley advised El Paso. Goldman Sachs acted as an adviser to El Paso on its previously announced spin-off and related matters to the Kinder Morgan deal, the companies said. The advisors are set to rake in a total of $100 million to $145 million in M&A fees, according to Freeman & Co.